Smart home voice control, and finally a Sonos product with HDMI. Gives TV sound a new dimension, with a natural and fine tone. There are more powerful devices, DTS support is lacking, and the wireless subwoofer doubles the price and then some. Sonos is high on the must-have list of many people, but others find it excessively expensive. 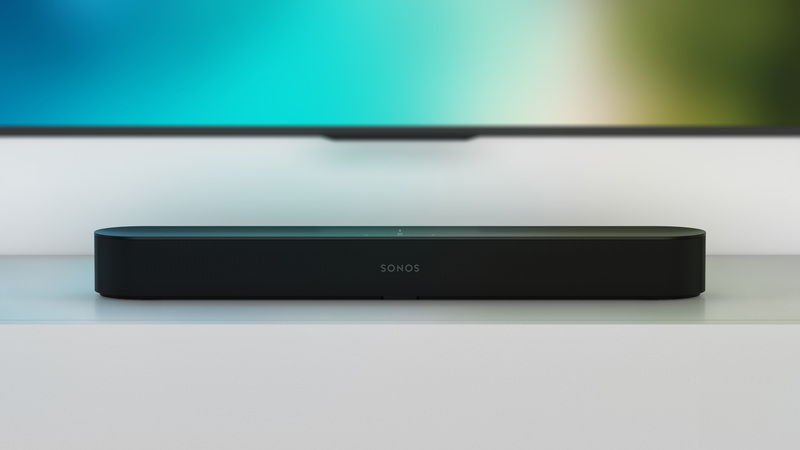 For those people, Sonos has now launched its Beam soundbar, which with a price of 4,000 NOK is almost half the price of its PlayBar soundbar and PlayBase soundbase. 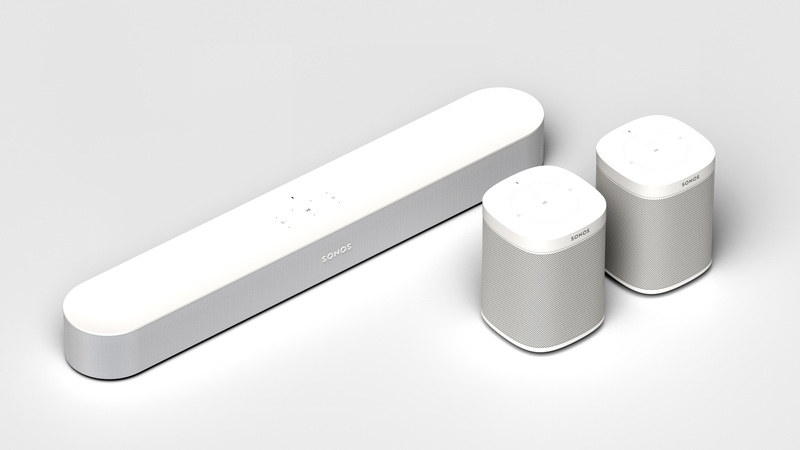 It still boasts the same convenient usability and multi-room functionality that Sonos is known for, in fact, it has more tricks than any other Sonos product until now. With Beam, you can use your voice to control both it and other smart gadgets in your home, thanks to inbuilt support for Amazon’s voice assistant, Alexa. Google Assistant is also on the way, which is going to open up a whole new world of voice control, given this is the smartest and most sophisticated voice control system on the market right now. In addition, AirPlay 2 lets iPhone users control Beam via Siri and it thus becomes a real competitor to Apple’s HomePod smart speaker. In contrast, users of streaming services like Tidal and Spotify will benefit less from Siri, as you can neither navigate through the music library or adjust the sound level. For that, Apple Music, iTunes, or local music on an iPhone is required. Beam is Sonos’ first product with HDMI. This in the form of an output. All video sources are connected to the TV which then sends the audio to Beam via the Audio Return Channel (ARC). In the past, the optical digital cable was used for this, which runs the risk of lip sync being less than optimal. However, if your TV does not have HDMI with ARC, Sonos has attached an optical to HDMI adapter. Dolby Digital is supported but not DTS, which needs to be converted to compatible audio (PCM) at source. The HDMI port supports simple commands from the TV remote, thanks to the CEC (Consumer Electronics Control) communication method. This allows you to turn the volume up and down and the soundbar on and off with the TV’s remote control. Other Sonos products can pick up the TV’s remote control via IR, but now that more and more TV’s have Bluetooth remote this will not work, and then there’s a definite advantage in being able to do this via HDMI. 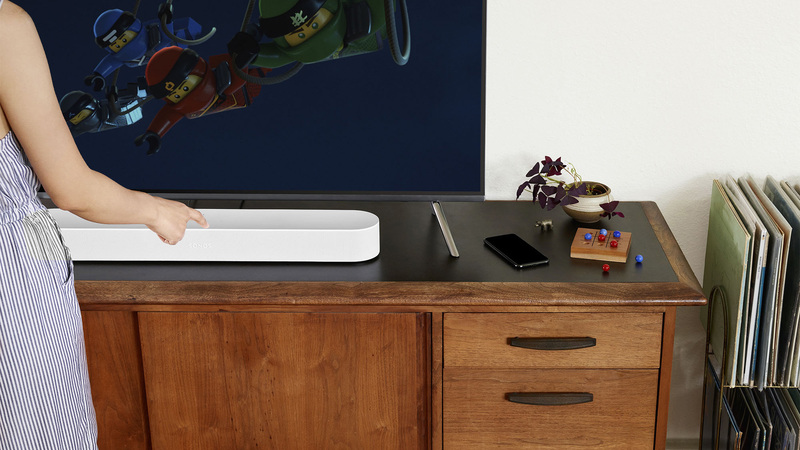 Sonos Beam doesn’t have a subwoofer, but like its big brothers it can be paired with Sonos’ wireless sub for heavier bass effects, and a pair of Sonos speakers can be used as rear speakers for immersive surround sound. The smallest Play:1 is the most natural choice. The price becomes obscenely higher with the subwoofer (it costs 700 EUR) while Beam along with two Play:1s only costs a little more than a PlayBar or PlayBase alone. Like its big brothers, Beam’s audio can be adapted to the surroundings in which it stands. Admittedly, for users of iPhone and iPad. Sonos uses the iOS device as a measuring microphone, and by moving this around the room while various test sounds are played from the speaker, Beam is optimized to the room. In practice, this works very well, the soundbar doesn’t change the tone character noticeably, but removes problematic frequencies that can make voices sound somewhat trapped, giving a generally airy and larger soundscape. In fact, room correction enhances the sound so much I advise Android users to borrow an iPhone for the occasion (correction need only be performed once). Hooking up Sonos Beam is easy. Connect to the TV’s HDMI ARC port, download and open the Sonos Controller app on your mobile. Press the button on the back of Beam and follow the brief instructions in the app. With the audio corrected to the room, Sonos Beam gives very good sound. Movie dialogue stands out clearly in the soundscape. Thanks to a dedicated, centered tweeter, which helps to give more air in the center channel than the full-tone drivers on the sides manage on their own. The time lagged side speakers contribute to a large soundscape that to some extent gives the illusion of surround sound. Beam does very well entirely on its own if you don’t have a large living room. The large, airy soundscape on Blade Runner 2049 is rendered well and, especially if you sit in the middle, you’ll almost think you have speakers behind you. The sound is primarily natural and tasteful, rather than provocative and explosive. A car sounds like a car and not a monster truck. For the “larger than life” feeling you get in a cinema, you’ll need more powerful equipment, and at the very least an external subwoofer. In contrast, the Yamaha YSP-207, which includes a subwoofer, for about the same price as Beam, has a more powerful sound with more force. But it also sounds sharper and harder, and given that it’s among the best soundbars in its price range, there’s no doubt that Beam is a very decent choice for the price. When it comes to music, it also sounds pretty good. Vocals and instruments keep their natural timbre intact. But for this purpose I’d like to be able to turn off the simulated surround sound as it is gets to be too much. This isn’t possible, Beam provides a big, spacious – and a little fake – soundscape anyway. If you mainly listen to music, there are better alternatives. Adding a couple of thousand will get you a Samsung HW-N660, which has even better audio than Beam on both music and film and also includes a subwoofer for more powerful sound. But it lacks network support and multi-room. With Beam, Sonos have hit the nail on the head, packing a raft of features like voice control and multi-room, along with great sound, into a soundbar costing just four thousand kroner. We just missed being able to turn off surround simulation when listening to music in stereo. And DTS decoding would have been nice. The HDMI port is welcome, and it can also control the volume from the TV’s remote control. If you want real surround sound, we recommend a pair of Play:1s as wireless rear speakers. Where the bass is concerned, unless Sonos are planning a less expensive subwoofer eventually, we would settle for the soundbar’s bass reproduction.